Farm To Table: Does It Matter What We Eat? Harassment in the Workplace: What Should You Do? Lesbian, Gay, Bisexual, Transgender – What’s the difference? Should the EEOC Extend Age Discrimination Protection to those Under 40? Why Are We Honoring Coretta Scott King on MLK Day? Why Don't People with Disabilities Self-Identify? This should be headline news. 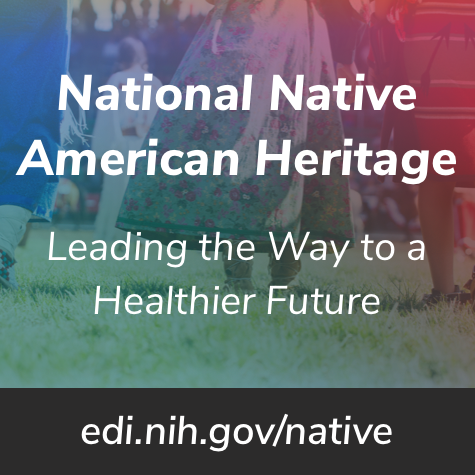 The National Institutes of Health (NIH) recognizes November as Native American Heritage Month. This month offers a perfect opportunity to pay tribute to Native Americans who have made significant contributions to the NIH and our great nation. We encourage you to take the time to learn more about Native Americans History using the timeline below. 1972 - American Indian Movement was one of the sponsors of the Trail of Broken Treaties, a cross country protest and presented a 20-point list of demands from the federal government. 1988 - The first Two-Spirit Gathering hosted by the Minneapolis Native American community. Chrystos released Not Vanishing, a book of poetry about the misconceptions and myths surrounding Native people and to illustrate issues of class, gender, and colonialism that have impacted the Native American community. 2008 - Coquille Indian Tribe on the southern Oregon coast adopted marriage equality policies, the first tribal nation to do so openly in the US. Recognized as a federal sovereign nation, the tribe is not bound by Oregon’s constitution. Do you have a story idea for us? Do you want to submit a guest blog? If it's about equity, diversity, or inclusion, please submit to edi.stories@nih.gov. For news, updates, and videos, follow or subscribe to EDI on: Twitter, Instagram, Blog, YouTube.